Why does my car pull when I accelerate? We get asked this question all the time.... "Why does my car pull to the right when I accelerate hard? This condition is called "Torque Steer" and is cause by engine torque being applied unequally to the front wheels. This condition is usually found in Front Wheel Drive vehicles. As the transmission applies torque to the drive axles, a small amount of that torque can be used up (absorbed) by the axle if it twists. The longer the axle is, the more torque it absorbs as it transfers that torque to the wheels. A shorter axle will have a tendency to absorb LESS torque as it is applied to the wheels. When the vehicle has two different length axles, torque can be applied unevenly to the wheels. 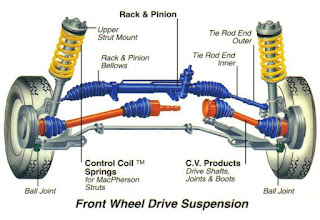 Another common cause of torque steer is worn suspension parts like control arm bushings. While this is not true torque steer, this condition can cause the same symptom. This time the problem is caused by a change in the alignment angles when accelerating. When the difference between the alignment angles of the individual sides becomes greater than about 1 degree the vehicle will suddenly try to pull to one side. Over the years the automobile manufacturers have done a couple of different things to help eliminate torque steer. Some manufacturers, like General Motors in the 80's and 90's, did it by offsetting the alignment angles in the direction opposite of the pull. Others, like Honda, use a solid jack shaft between the transmission and the axle so that BOTH axles can be the same length. Your vehicles suspension takes a beating on the road everyday. Having it inspected by a certified technician can prevent a major problem. Kool Kar Auto Repair is Your Source for All Things Automotive. Unfortunately, it’s not easy for everyone to buy original parts for their car, so used auto parts seems to be the best option. No matter, how old your car is, auto parts fail frequently and you need to replace them instantly for long run.